Count Like An Egyptian: More fun than you think! Posted on 6 October 2014 by skullsinthestars | Comments Off on Count Like An Egyptian: More fun than you think! Greg Gbur is an associate professor of physics, specializing in optical science, at UNC Charlotte. I’ve been a fan of ancient Egyptian history and culture since I was a kid. My Dad would take me to the Field Museum in Chicago and we would browse the beautiful Egyptian art and artifacts. When King Tutankhamun’s treasures reached the Field Museum in 1977, I was there to see them, standing in lines that rivaled those of Star Wars, which opened earlier that same year. One aspect of ancient Egyptian culture that I failed to pay much attention to, however, is mathematics. Conventional wisdom for years has suggested that, although ancient Egypt had a functioning mathematics system, it was rudimentary and flawed in many ways. I assumed that this was the case without looking too much into it – besides, what sort of insight could one gain from learning an antiquated system of mathematics? Now a book has come out that aims to correct these flawed opinions of ancient mathematics: Count Like an Egyptian by David Reimer, an associate professor of mathematics at the College of New Jersey. Let’s get this out of the way: Count Like an Egyptian is, at heart, a textbook. If you read this book properly, you won’t just get an abbreviated summary of how Egyptians used mathematics in government and business. You will learn how to do it yourself, through detailed examples and exercises. You will, in fact, learn how to do almost everything that Egyptians could do themselves, from addition and subtraction to multiplication and division. You will also see how it would be applied in practical problems like divvying up a fixed amount of bread to give as salary to temple employees. This might seem to be a deadly combination of mathematics and history, but it is not. The lessons are made enjoyable by good writing, excellent storytelling, and fascinating anecdotes about life in ancient Egypt. Beyond that, though, it is incredible to see that it is possible to formulate a functional system of arithmetic that is completely different from the one we know today. To give a taste of the simplest Egyptian math, let’s look briefly at an example of whole number multiplication, specifically the multiplication of 19 x 17. The way I learned to do it in school is as shown to the right. It looks compact, but there’s a surprising amount of memorization involved. We need to have our multiplication tables memorized through 10 x 10, at least. In this case, we need to know off the top of our head that 9 x 7=63. How would Egyptians do it? Write 1 and 17 side by side, and write 19 above the 1. Then, double the two numbers again and again and write the results below. 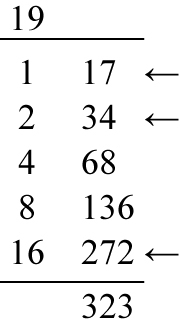 Now, we note which sum of numbers on the left add up to 19 (in this example 1, 2, and 16). Then the corresponding numbers on the right will add up to the product of 19 x 17 (17 + 34 + 272 = 323), giving us the same result as modern arithmetic. On paper, it looks like we’ve done a lot more work. There are, however, two advantages to the Egyptian method. First, the logic of the calculation is much clearer. We are simply adding multiples of 17 together. Second, we need to have less math memorized in order to do the calculation. We only need to know in advance how to multiply numbers by 2, something that is intuitively obvious! Early in the book, Professor Reimer notes that this difference in the way we think about mathematics is important. As he explains, “our brains don’t recognize our multiplication tables as mathematics.” The multiplication tables get stored in memory separate from the part of our brain that actually does the mathematics work. This means that many children can struggle greatly with elementary mathematics. I can relate to this on a personal level. When I was in junior high, I struggled with – and hated – the “advanced mathematics” class, which covered all the advanced multiplication and division stuff. I nearly failed my first algebra class, which seemed like a completely different system. When I got to high school, however, I found that I loved higher math. In hindsight, I may have been fighting with exactly the cognitive problem that Professor Reimer describes. With that in mind, Professor Reimer may have – inadvertently – made an argument in favor of the much-maligned “common core” math, as described and defended recently in this post. If you look at how common core subtraction works, you can see the similarities to the ancient Egyptian techniques. In both cases, the developers of the algorithms were interested in devising methods that would make a student think about math in the most intuitive way possible. This isn’t to say that ancient Egyptian math is perfect – it has a real weakness in not using a decimal notation for fractional numbers – but it provides a wonderfully different way to think of elementary calculations. In the final chapter of the book, Professor Reimer makes a critical comparison of our modern techniques and those of the Egyptians. Modern education politics is beside the point ofCount Like an Egyptian, which is a wonderful foray into the surprisingly elegant math of the ancient Egyptians. As I have already said, it is not a casual read, but there’s something to be said for spending a bit of time to think about the way things are done – this could be said to be the lesson of the book, in a nutshell! This entry was posted in Follies of the Human Condition and tagged College of New Jersey, David Reimer, Egypt, mathematics. Bookmark the permalink.